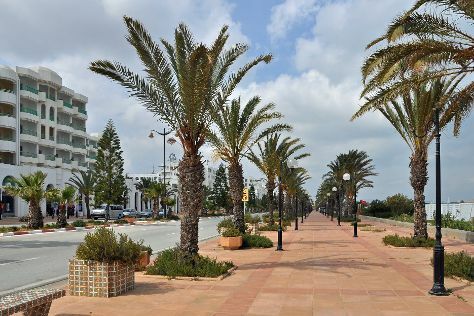 Kick off your visit on the 17th (Wed): get engrossed in the history at Sousse Archaeological Museum, contemplate the long history of Bourghiba Mausoleum, then contemplate in the serene atmosphere at Grande Mosque, then browse the eclectic array of goods at Medina of Sousse, and finally examine the collection at Magiceye Sousse. To find other places to visit, where to stay, traveler tips, and more tourist information, use the Sousse trip planner . Kuwait City, Kuwait to Sousse is an approximately 18.5-hour flight. Due to the time zone difference, you'll gain 2 hours traveling from Kuwait City to Sousse. While traveling from Kuwait City, expect colder days and little chillier nights in Sousse, ranging from highs of 26°C to lows of 17°C. Cap off your sightseeing on the 17th (Wed) early enough to go by car to Hammamet. Kick off your visit on the 18th (Thu): don't miss a visit to Medina of Hammamet, then wander the streets of Yasmin Hammamet, and then stroll through Hammamet Beach. To find traveler tips, maps, and other tourist information, go to the Hammamet tour itinerary builder site . Drive from Sousse to Hammamet in 1.5 hours. Alternatively, you can take a train; or take a bus. In April in Hammamet, expect temperatures between 27°C during the day and 14°C at night. Wrap up your sightseeing on the 18th (Thu) early enough to travel back home.